I am 67 years old and have been canning most of my life. I grew up out in the hills with no electricity and still live that way. I can a variety of meats prepared in any way that strikes my fancy at the time. There is a difference in the safety of pressure canned over water bath canning on meat and vegetables. For fruit, sauerkraut, pickles and jam, water bath is the best way to go. I don't recommend that you take the chance of water bath canning meat or vegetables because of the high incidence of botulism poisoning and assorted other health issues. 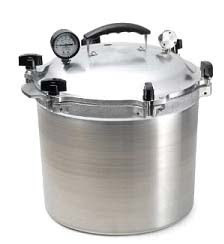 The internal temperature of the food in the can or jar must reach a certain temperature for a set amount of time to kill these organisms in the food which isn't easy to do using the water bath method. I grew up only using water bath method, and we even canned meat and fish, but now I hesitate to even mention times and methods of doing so. It can be deadly. Every year here in Alaska, there are deaths attributed to improper canning or food storage. For myself, I prefer a pressure canner using no rubber gaskets at all, only metal to metal seal, with screw down toggles. To me it is the safest canner made. I personally love the All-American pressure canner. No rubber gaskets to worry about and with the screw down toggle closure, it is the safest canner on the market, as far as I know. There may be other canners made in the same style, but I have 3 different sizes of the All-American, all various ages, all still work very well. It is an All-American Pressure Cooker, made by Wisconsin Aluminum Foundry, Inc. in Manitowoc, Wisconsin 54220. At least that is where they were located waaaay back when I got mine. I make mini meatloaves and can in brown gravy, or fix the meat in any manner you want the finished product to taste like, only go lightly on the spices as some do not handle the extreme heat and pressure without changing, and some become bitter. If canning anything that is extremely solid pack or has added starch of any type, it is best to hot pack the jars, and then continue with canning never letting them cool before processing. You really want the center of the pack to reach the appropriate temperature during processing. BARE BONES BASIC MEAT CANNING: You can just raw pack the meat, trimmed and cut into cubes, with a smidgeon of salt per jar (scant half teaspoon per pint jar), no water added. Cut meat into small chunks or cubes, trimming off anything you would not eat if fixing any other way. If you don't like fat on your meat, trim it off. Leave about an inch of empty space at the top of the jar, wipe the rim of the jar well, and make sure no nicks or cracks, put the lid on firmly but not tightly. The single most important thing in any type of canning is to keep everything extremely clean. Pack the cut meat chunks into the jars not extremely tight, but not really loose, either. Do not add other liquids if doing a raw pack of meat, it will form juices as it cooks. If you want a firmer gelatin in the cooled jar, add a teaspoon of plain gelatin in the bottom of each jar before adding the meat. Wipe the rims clean and place clean sterile lids and rings on the jar, closing firmly. Think average woman firmly, not he-man firmly. Have your pressure canner on the stove, but not heating up yet with raw pack. Make sure the trivet is in the bottom of the canner and enough water to not boil dry while venting steam, usually at least 2 inches of water. Fill the canner with the filled closed jars of meat. If you have the room in the canner to place another layer of the jars in an upright position without touching the lid of the canner, place another trivet evenly on top the first layer of jars, and add a second layer of filled jars with lids. If you don't have enough jars to fill a layer, add empty jars with just water in them, no lids on them, to help keep jars from possible tipping over during processing. Place the lid on the canner, and gently tighten all the toggles around the lid, doing the 2 opposing ones only to touching, all the way around the lid, then gently tighten 2 at a time, opposite each other, so you are applying even pressure on the lid all the way around. These canners are made of aluminum, and it is soft. The lid has an arrow on it that needs to be pointed at a mark on the side, every time, as the lid will seat correctly doing this. Remember to exhaust the steam from the canner first, before starting to build pressure, so you have a more accurate pressure reading. County Extension Service usually has temperature/pressure charts available if you have one in your area. Bring the canner to a boil, letting the steam exhaust for about 10 minutes through the open petcock valve. Then flip it down, so pressure will start to build in the canner, watch the gauge. When it reaches 10 pounds pressure at sea level, you will have to adjust for higher elevations, then you turn the heat down to maintain that pressure, neither rising nor falling, for 1 hour, 30 minutes for pint jars. When the time is up, turn off the heat and let the pressure drop by itself, do not open or raise the petcock until the gauge is at zero. If the pressure falls below 10 pounds of pressure during the cooking interval, restart your timing after you get back to 10 pounds pressure. Turn off the canner after the time is up and allow it to lose pressure on its own. Do nothing to speed the drop in pressure. Once it is back to zero, open the petcock, and then unscrew the toggles and remove the lid slowly, away from you so you don't manage to scald yourself a bit with the steam. Remove the jars carefully from the canner, placing on a heatproof surface and out of any drafts, lightly cover if you worry about drafts hitting and breaking the jars. I cover mine with a large towel. Empty and clean the canner. The jars should all seal within a short time. Do not remove rings until you make sure the jars are cold. I usually wait a couple of days, and recheck the seals before putting the jars away in a cool, dry storage area. It is also helpful to label the jars when they are cool, as no matter how good your memory is, a year or two down the road, you might not remember exactly what it is, in that jar. Canned meat can be used as any cooked meat. HOWEVER, there are so many other ways to can meat, you will seldom do this after you get going on it. I can meat patties made from hamburger or sausage, and browned burger, canned dry pack to use as any browned burger in any recipe. A pint is about a pound of browned burger. Meatballs can be cooked and either dry packed hot or canned in any sauce you choose. Try not to use too heavy a gravy in home canned meats; the starch can slow the amount of heat reaching the center of the jar for the required amount of time needed. Mini meatloaves in light brown gravy are delicious. Sliced roasted turkey or any roasted meat in light gravy or au jjus is very nice. Want a tender French Dip sandwich? Open a jar of sliced roast beef or venison in au jus, heat place on a roll and dip. If you want to experiment a bit, add a few drops of liquid smoke in the bottom of the jar, before adding meat. It gives it a nice smoky flavor for making sandwiches later. Canned meat is really good to grind after opening. Mix with chopped onion, pickle, what have you, and add mayonnaise or sour cream and mustard as a sandwich spread or dip. I use a small single burner camp propane burner that is really cheap to do outdoor cooking and canning in the summer. I also have a huge All-American canner too big to lift easily on a stove that has been fitted into the upside down metal trash can with the bottom cut out, and vent holes for air cut around the bottom. Then a weedburner unit was cut and angled so it faces up onto the bottom of the huge pressure canner, so it can be hauled to the river or ocean to can super fresh fish on site. I'd like to add some emphasis on wiping the rims of your jars ~ we canned chicken and beef one time, and got lazy on this step. Many (if not most) of the jars came un-sealed and we had to throw it out! Grease from the meat will get on the rims, causing the lids to seal failure. Make sure you wipe your rims!